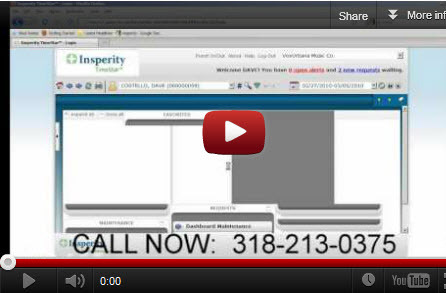 Watch TimeStar Insperity Video Demonstration Now! Choosing the optimal time & attendance software solution to meet the unique needs of your business can be a complex and sometimes overwhelming task! However, by collaborating with the right team of experts who will listen and perform the due-diligence to understand your objectives and company culture, the entire process will be a stress-free experience you can have total confidence in. Insperity Time and Attendance has been engineering, implementing and supporting time and labor management systems for the mid-and-small market since 1988. From the beginning, we have remained committed to our unique and highly- consultative approach to Time & Attendance and Human Resources Technology. We certainly understand that one-size solution does not fit all! This is why Insperity Time and Attendance offers TimeStar™; our flagship, third-generation, web-native timekeeping product line in a variety of configuration and delivery models. TimeStar™ is a true real-time solution. TimeStar's™ 100% Internet-browser based user interface offers unparalleled accessibility. and Accounting Platforms and Bureaus. TimeStar™ employs the industry standard, powerful Crystal Reports® reporting engine. To discover more about the TimeStar™ Timekeeping System that best matches your business goals, let's start by determining which software delivery model is best for you. With TimeStar Enterprise™, you purchase and own the software license and the complete solution is deployed within your internal corporate I.T. network. Through the TimeStar™ Support Program, Insperity Time and Attendance is your partner in maintaining optimal performance year-after-year. Configurations are available, ranging from high-value, streamlined SMB packages to highly-optimized, large-enterprise deployments. Looking to reduce your I.T. overhead or conserve capital? TimeStar™ On-Demand is an ideal fit with no up-front licensing costs and straightforward, per-employee/per-month "subscription" pricing. Insperity Time and Attendance hosts and manages the entire I.T. infrastructure at a world-class SAS70-TypeII data center. Whether you're an SMB looking to automate for the first-time or a large-enterprise ready to leverage the SaaS model, Insperity Time and Attendance has a TimeStar™ On-Demand solution to fit.